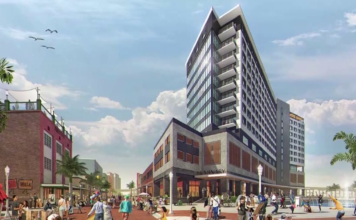 A drawn-out fight over the controversial Luminary Hotel project in downtown Fort Myers could finally be over. The Fort Myers city council just proposed a settlement and committed $2 million taxpayer dollars to keep hotel construction going and to turn an island in the Caloosahatchee into a park. A 1936 deed for the land where the Luminary Hotel is being built has a restriction, the original owners of the deed said the land is meant for public use. But now the city has found a loophole: a deed transfer. It would move the deed restriction from the land downtown to an island in the Caloosahatchee. “The concept of the island I think is outstanding. It sounds like a lot of fun!” said Tim Schribner of Fort Myers. The island, once referred to as Rat Island would be renamed Legacy Island Park and the city is committing $500,000 for amenities like benches, trails and security. “The city is getting more park space, more than quadrupled it. The family seems to agree with it,” said Liston Bochette with city council. But now the city says they need more money, $2 million, to continue construction of the hotel. The island park is still contingent on the approval of the judge and all of the descendants of the deed. However, the outside attorney for the city said almost everyone is on board so far.